Have you ever tasted food with changed taste and texture from being kept in the cooler too long? Did you know that change is a result of food being cooled too slowly? Commercial blast chillers and freezers cool foods quickly enough to retain their quality, flavor, taste and texture. Because typical coolers and freezers bring a food’s temperature down slowly, large ice crystals (macro-crystals) are formed in the process. These macro-crystals damage the cells of the foods so that its consistency and quality are compromised. Blast chillers, on the other hand, utilize low temperatures to quickly cool food with a process that creates only small ice crystals (micro-crystals). Micro-crystals cause no damage to the food’s structure and leave its taste and texture unaltered. Most blast chillers and freezers utilize a blowing method, where cold air blows on the food, cooling it to the proper temperature. 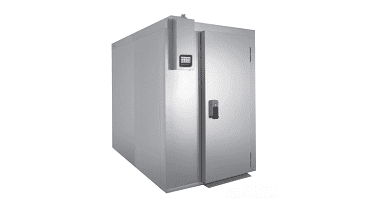 ThermalRite blast chillers use an “ambient chill” method that’s nearly opposite the typical approach. Ambient chill removes the warm air from the unit, achieving the same cooling effect while providing two key benefits over the blowing method. 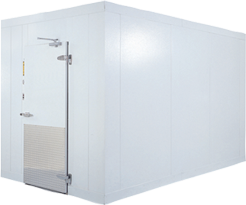 The first benefit of the ambient chill method is increased food safety. Although operators do their best to ensure that the blast chiller stays clean, it’s inevitable that debris will enter the unit at some point. Blowing methods may scatter this debris onto the food, while ambient chill has no possible debris flying about and compromising the food’s integrity. While blast chilling retains the food’s flavor and texture, one common complaint is that they can dry out foods. But blast chillers that utilize the ambient chill method do not have that blowing factor and will not dehydrate the food. In fact, a ThermalRite blast chiller is the closest you can get to preserving a food’s moisture, flavor, taste and texture for an extended period. When we created our ThermalRite blast chillers, we took the two biggest complaints about blast chillers and changed them for the better. We allow chefs and operators to move food straight from the oven or steamer directly into the unit while still preserving their efforts to make delicious, high-quality food. To learn more about blast chiller benefits, read how blast chillers can guard against health code violations.